Most of you that frequent this site are well aware that of the big changes that have occurred with land ownership on the summit. 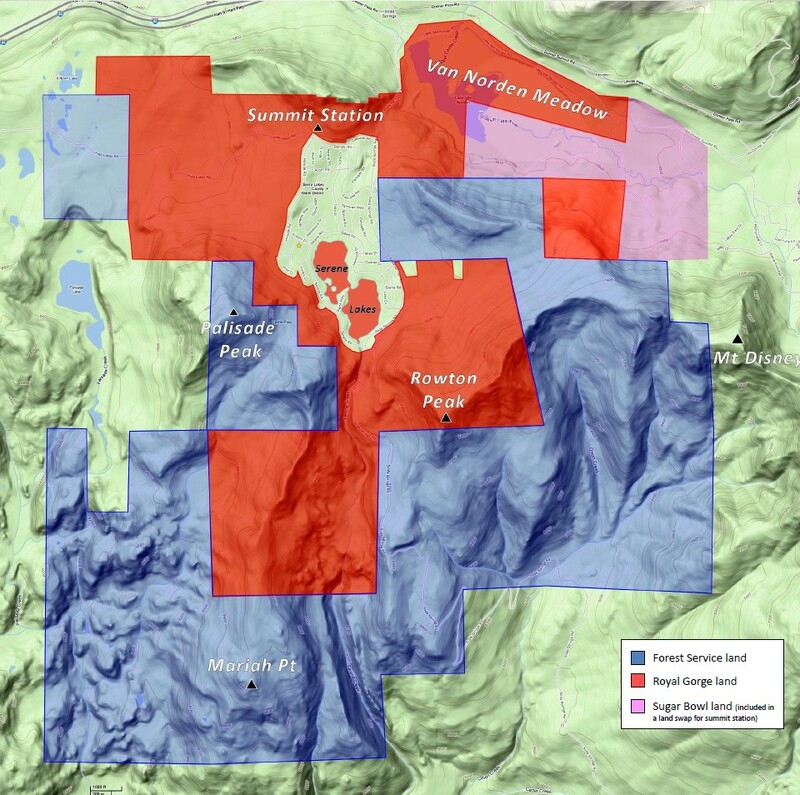 After a whirlwind summer of local fundraising by several different organizations, the Truckee-Donner Land Trust (TDLT) and the Trust for Public Lands (TPL) were able to purchase the summit land formerly owned by Royal Gorge LLC (see map) on December 20th. The rocky history of the development plans that were thwarted by local opposition and a sinking economy have been well documented and will not be discussed here. Now that the land has been purchased for conservation, the big question is what happens next? As many of you that live on the summit know, land ownership in the area has long suffered from the “checker board” effect. In the mid 19th century when the railroad was being built, the government instituted a policy in which land ownership in the area was divided into square mile sections of alternating public and private ownership to give the railroad owners an incentive to build. While that may have worked well for the railroads, it has wreaked havoc on natural habitats and open space. It has been the goal of land conservancy groups in the last 100 years to replace the checkerboard with open space boundaries that make ecological and conservation sense. The acquisition of the Royal Gorge properties has gone a long way to achieve that goal for the summit area. 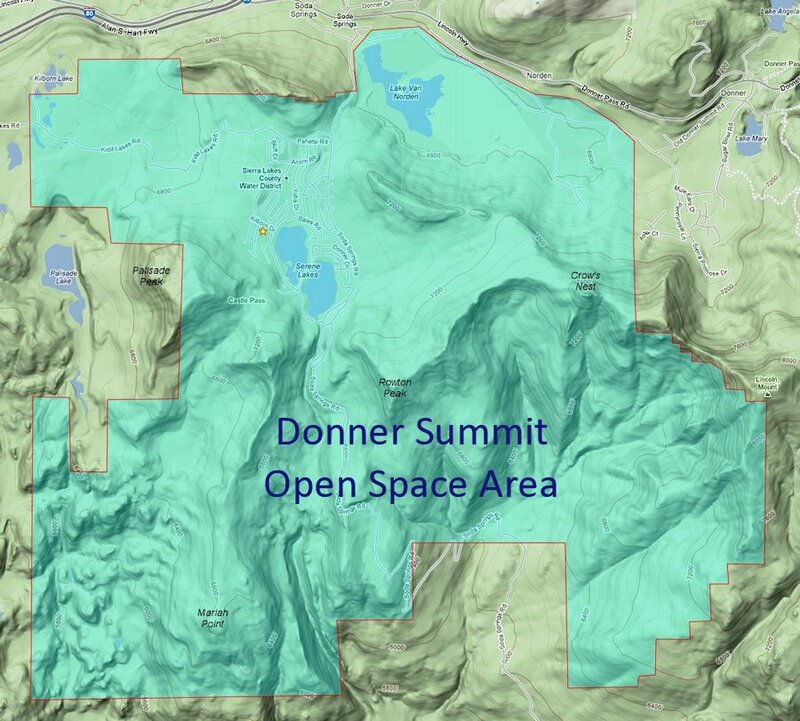 The combination of Royal Gorge land and US Forest Service land will soon result in a tract of contiguous public open space on the summit of over 9600 acres which for the this article I will refer to as the Donner Summit Open Space Area (DSOSA). As you can imagine, the creation of such a large area from land that had been formerly closed to public access is a complicated undertaking and involves a large number of stake holders. In the coming years, the TDLT will be challenged with the creation and implementation of a plan for conservation stewardship of the land to make it publicly accessible. This will involve trail creation for hikers, mountain bikers and equestrians. There are also serious questions of forest and meadow stewardship to correct the years of neglect that has occurred while the land was under private ownership. In the next parts of this article, I would like to address three important concerns for the future of the DSOSA. Implementation of public access to the properties. I will address each of these concerns in separate posts in the coming weeks. Thanks, George, for beginning to think of the future of this amazing accomplishment. I would be happy to help in any planning. Thank you for looking forward to next steps and opening a discussion among the community.